Hot off the heels of their collaboration with Costello Tagliapietra (which is still in stores now), Uniqlo is teaming up with Velvet [subscription required] for a line of knits. Called Uniqlo + Velvet, it features 14 jersey pieces retailing for a very nice $15.90 to $19.90 and hits all 950 Uniqlo stores worldwide on June 17. Expect a casual, Southern California vibe. The collaboration also includes a line of six cashmere pieces that will hit stores in September and retail for $99.90 to $129.90. Ever since he got unceremoniously dumped from Nina Ricci, the fashion flock has been speculating as to where Olivier Theyskens would end up next. It's not Ungaro, and not Hermes but...Theory. Theyskens is designing a capsule collection for Theory [subscription required], set to hit stores for spring/summer 2011. No further details are available at this time, but as soon as I have some, I will of course share them. Finally, Pierre Hardy's summer Design Editions shoe collection has hit Gap.com. 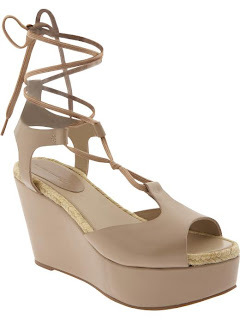 The four styles range from $65 for the denim espadrilles to $110 for the lace-up wedge sandals, which I have my eye on. Now all Gap needs to do is send me a coupon code, and they will be mine.